Deepest apologies for not having written to you all for such a long time - oh woe and alack and stap me vitals. The explanation, though laughable, is indeed true. All my books up till the present, have been written on my trusty word processor which, with its built in printer, and its gleaming sleek lines I loved like hell. Then, at last, the dreaded day came. The manufacturers declared it obsolete and refused to make ribbons for it, so I was forced into buying them at tremendous cost on Ebay. A ghostly apparition appears clad in grey and laughs a sarcastic laugh. And I truly felt foolish that in this computer age I was the silly old fool that couldn't handle one. Enter my two grandsons who with great ease and skill taught me how to work the beastly thing. Then they insisted that I bought a printer which I can almost use only that the art of sending photographs still eludes me. But enough of my sad tale, you'll all be wondering what I have been up to. 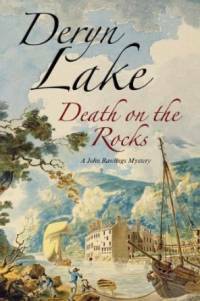 The answer is that I completed the latest book, which is a John Rawlings novel entitled Death on the Rocks , in August. It is being published on 19th December and I am going to have two launch parties, one on Saturday 21st December at British Made, a wonderfully eccentric shop in Battle High Street. This will start at noon and go on until 3 p.m. when the inhabitants of Battle will pour out onto the street heavily laden with copies. (I hope!) The second one, to which all my readers who live within striking distance of London are invited, is at The Old Bell in Fleet Street - a drinking establishment often frequented by Mr. Rawlings himself. This will be held on Twelfth Night, 6th January 2014, starting at 6 p.m.and continuing until 8 p.m., when a line of carriages and hearses will remove the revellers to a nearby chop house in pursuit of an ordinary. So what kind of a year have I had? Mixed fortunes as I strove hard to master the aforementioned computer. But within 48 hours of completing the book I flew to Le Touquet with my friend Carol Lomas, whom I met on the Nile, to have yet another ball. We went from Lydd Airport and boarded a little wind-up plane that only had eight passengers in it. As we saw the White Cliffs of Dover disappearing we could see the French coast in the same glance. Then we went down the coast to la belle France. We started Le Weekend with champagne and in the evening went on to cocktails. We then discovered a fabulous boutique run by a French gypsy called Gigi. I spent all the money I hadn't got, borrowing heavily off Carol who fortunately had her credit card with her. My liver has now repaired itself I'm sure you'll be glad to hear. However, having got back from France I flew off to Crete at the invitation of my daughter and husband Paul. I really appreciated this time getting to know my grandson Fintan better. He's a great kid, much more sensible than his mother (!) and he and I got on really well. But Crete was having a heatwave and I found it all a bit much, sticking to the shade. The island was full of Russians, very charming people who couldn't speak a word of English, but much was accomplished in sign language. I am very shortly going to put some photographs up but I thought I would get this newsletter done before my webmaster goes broke. I have some of a charming Russian little boy which is the somewhat convoluted chain of thought that I am following. Got home to find the lovely sunshine and the copy edited proofs awaiting me. Having waded through that lot and sent them off on time I had several chats with my editor, Anna Telfer, who is very considerate, and as usual was buoyed up by my agent, Vanessa Holt, who is such a great friend. So the book lies waiting, with its beautiful cover painted by Turner, that gorgeous man, and the bag of goodies inside. I hope you all enjoy it and will let me know in your hundreds - I was going to say thousands but thought it sounded a bit much. Subscribe to Deryn Lake's Newsletter. If you would like to receive occasional newsletters like this one from me by e-mail, please sign up here, using the form below. (You can also use this form to change your email address or cancel your subscription.) I don't promise to write often - my real job is writing the books! - but I will do my best to keep you up to date with news of events, new books and other information. You can read the archived newsletters - with some added pictures! - on this site: I hope you will want to sign up for future mailings. Your email address will remain confidential to me and the people who look after my website; we won't pass it to anybody else, nor will we send out mailings on behalf of anybody else. Each newsletter you receive will remind you how you can unsubscribe, and you will also be able to do this via the website. After you press the Subscribe button, we will send you an email to confirm that it was you, and not an impostor, who filled out the form. Please look out for that email and click the link to confirm your free subscription. Important: we have found that some ISPs, particularly AOL, treat this email as spam, so please check your spam folder if the message has not arrived within an hour or so. To ensure that the newsletters themselves get past the spam filters please add derynlake dot com to your 'white list'. There's some information about how to do this at http://www.emailtools.co.uk/tips/whitelisting.htm (we are not associated with this web site).